My two-year-old and I heading into the grocery store earlier this week. I wrote a blog post a couple of years ago about “cartless” shopping. At this point in time I’d rather live through that again than what I experienced this week: double-cart shopping. My mom took great care of my boys while I was at the hospital delivering our new baby girl. She fed them, chauffeured them, cleaned up after them and loved them. And in pure grandma fashion, she bought them things. My youngest convinced her to buy him a mini grocery shopping cart. He’d been dying to put it into action for a couple weeks. On Tuesday morning he saw his chance. When he heard we needed to run to the grocery store, he ran to his closet and pulled it out. And “help” he did. No matter what I did or said he wouldn’t listen. He was going to take his cart. We walked side-by-side into Wal-Mart. 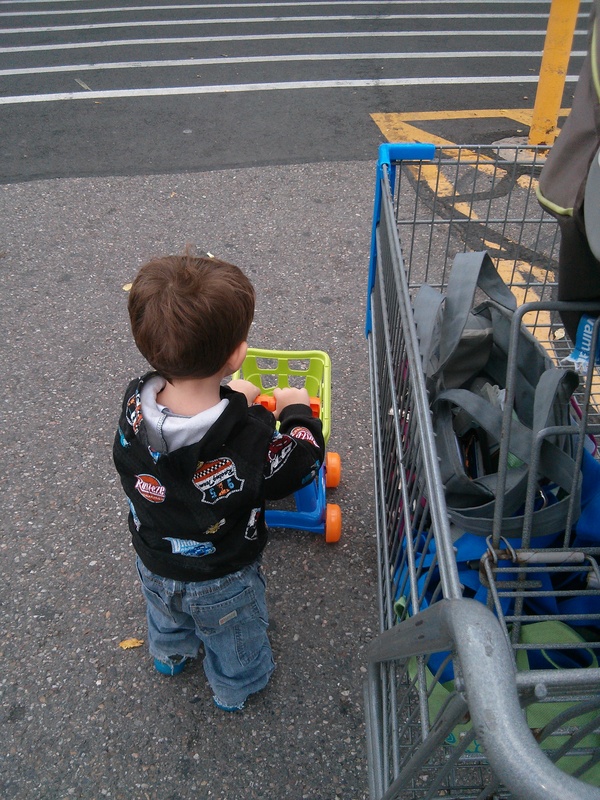 Me pushing a big metal cart and him pushing a bright green plastic mini one. He was in heaven. I was not. His enthusiasm was cute. I’ll admit that. He ran to get things to fill his cart. But most things were too “heavy.” So he settled for pushing our cool whip and muffin mix. Most people smiled and chuckled when they saw him coming down the aisle. They commented on how cute he was. But then again there were a few people who saw him and ran the other way. Especially when they saw how crazy a driver he was. He was crazy. I can’t tell you how many times he ran over my feet. He nearly tripped me about a hundred times. He nicknamed himself “sorry” man because he was saying sorry to me so much. I should have nicknamed myself, “come on” woman because I was saying that to him so much. I had to keep reminding him to pay attention to where he was going and to keep his legs moving. Not to mention steering his cart in the right direction. For some reason he loved pushing it backwards. Maybe because he thought he had mad skills. But he didn’t have mad skills. He kept running into shelves knocking over things like ketchup bottles and cereal boxes. Then he’d get his cart stuck on a shelf and have to back up a few steps before he could move it again. It got really scary when we tried to cross traffic when moving to aisles that faced the other direction. He ran into several people (mostly elderly) while not paying attention. That’s when people started splitting when they saw us coming. I took dozens of deep breaths to keep from losing it. It was cute but it was stressful. I love him but I don’t love his cart. It took us about two hours to get our small list of groceries. I was exhausted at the end and I am sure he was too. He pushed that cart hard and he made it through the entire store. We had to stop at one other place before going home – Sam’s Club. Luckily I convinced him that mini carts weren’t allowed there. We were in and out of there in 10 minutes. Granted we only had to buy some bulk bags of Halloween candy and giant tub of butter, but still. To celebrate for not losing it at Wal-Mart and to calm my nerves, I opened up one of those giant Halloween candy bags on our way home and ate two Twix bars and a Snickers. I definitely needed some chocolate.